I love the idea of gifting (or being gifted, hint hint!) a hamper of goodies for any and all special occasions, and when it comes to Valentines day, there’s nothing sweeter than a box of goodies to make you feel spoilt by your love, or, to share with them. Valentines boxes don’t have to be about partners, hell, Valentines Day doesn’t have to be about that one special person in your life, it can be about anyone special in your life, Valentines Day just gives us an excuse to spoil them, and Valentines boxes are the perfect treat. Before you put your box together, make a note of all the things your Valentine loves, from foodie gifts to their favourite shows or films, tipple, and some of your favourite memories. It’s crazy how many ideas suddenly spiral out of this list if you’re anything like me you will easily get carried away! Looking for more inspiration? Here’s a cute and easy Valentines box that is sure to fill anyone's heart with all the warm and fuzzies. Roses are a traditional Valentines flower, but this candle is sure to outlast any bouquet you could give your sweetheart. With such a strong, rich aroma, it will fill the room, and set the perfect scene for your Valentines evening. How could I create a gift box that didn’t include gin? I got a bottle of Warner Edwards dry gin over Christmas and it’s seriously delicious, jam packed with hand-picked botanicals and a smooth finish. I’ve tried the rhubarb flavour too and it’s just, oh me oh my, delicious! It didn’t actually taste like gin, which is dangerous in my books! If you can’t indulge on Valentines day when can you? Delicious, rich, and very fancy pants, these luxury truffles are so tasty. Just make sure you get a box with an even amount in, you’ll be fighting over the last one more than the last rolo! I’m a huge fan of Sweet Cecily and their DIY kits are brilliant! We all love a good pamper, but there’s something really fun about make your own products. Sweet Cecily's have put together a really simple to follow but effective kit that gives you all you need to make your own face masks. Easily enough for both of you to pamper yourselves with too! They’ll even pop a personalised message on the packaging for you too! Gone are the days when you would sit by the radio, desperately trying to record your favourite songs without including the DJ’s voice overs, now it’s as simple as plug this handy dandy USB into your computer, pop on your favourite tunes that remind you of you and your Valentine, and pop it back in its tape case. I absolutely love this idea, and it brings a more traditional gift into the modern day. It’s so cute how it includes the sleeve you can write all the songs on too. Being a USB, it’s also something you could add to as the years go by! Perfectly popped, handmade right here in the UK, with 100% natural ingredients, Joe & Sephs has taken gourmet popcorn to a whole new level. We got an entire stocking full of their popcorn at Christmas and each and every flavour is unique and so good, I mean who would have thought coffee or whisky, or even camembert would make perfect popcorn flavourings? Oh they do, they really really do! Because there’s nothing more relaxing, or indulgent, than a good cup of tea. This fruit tea is delightful and sure to warm even the coldest of hearts. I love Teapigs for their awesome flavour combinations, so if fruits don't take your fancy they are bound to have something to tickle your tastebuds. If you’re popping some tea into your Valentines box, then why not pop in a personalised mug too? I love this beau-tea-ful mug that allows you to add up to three images of your own. Everyone loves receiving something personalised and it’s doubly great when it’s something you can get some use out of too! 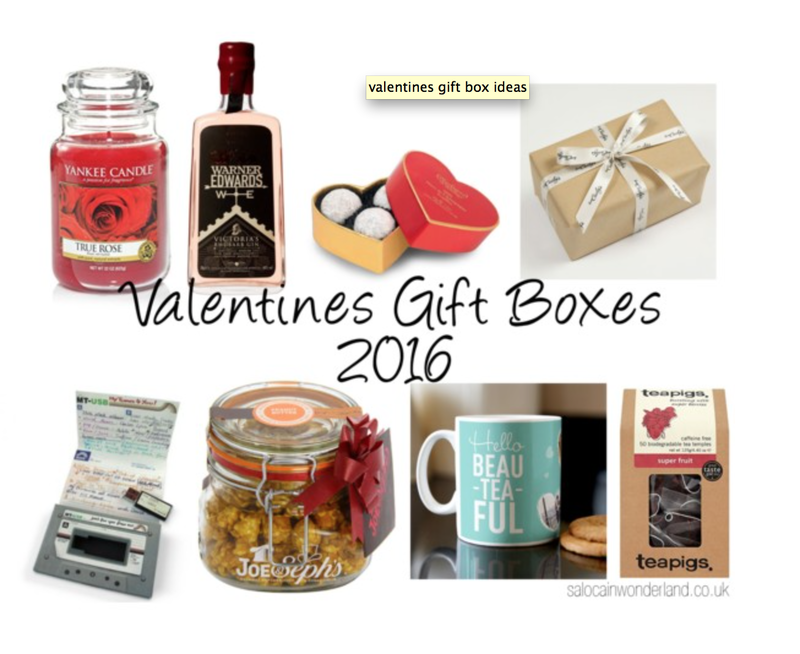 There’s just a few ideas to get the ball rolling when it comes to your own Valentines box. What else will you be putting in your Valentines gift box? I would love one of box like that! Looks so amazing! I am such a Yankee addict! I will never say no to a new mug or chocolates! I'll take the booze please. These are cute ideas! I would actually love a mug as a Valentine's day gift!